Below you’ll find the canonical reference for Thanksgiving email planning. From email examples to specific promotional strategies, we’ve included everything you need to ace your campaign. We admit it – we wish we had come up with this clever twist on the standard "thank you" email. 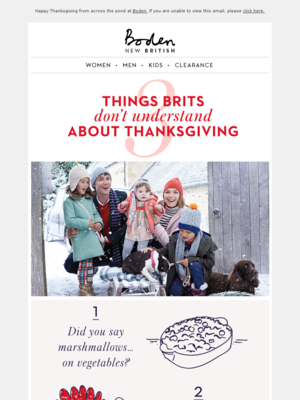 Boden, a UK clothing retailer, has fun with the uniquely American holiday but finishes with a sincere thank-you. It also includes a soft promotion that doesn't distract from the centerpiece copy and images. Well done, as they say! 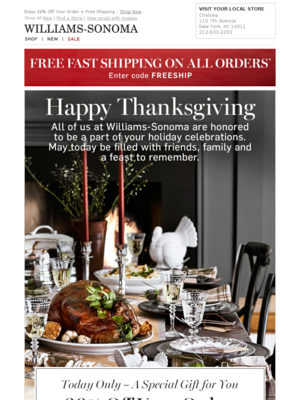 Thanksgiving emails aren't just mall-brand merchants. 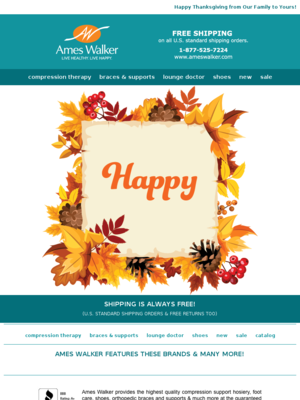 This retailer of health-care therapy products created a simple but attractive Thanksgiving message for customers who likely have a stronger affinity for its brand than the average fashion buyers. 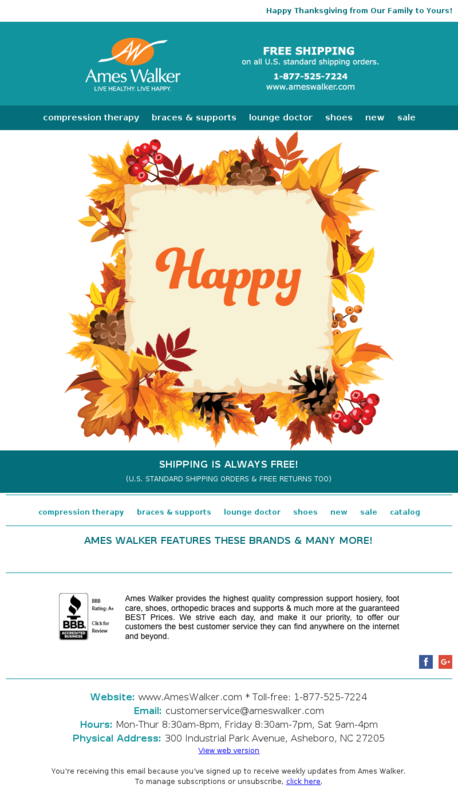 This email packs a lot of content into a single message: hero image that combines a thank-you message with a subtle promotion (all items in the photo are for sale), easy-to-click exploding-offer deals, and a store finder for customers who might be reading the email far from home. All this content could make the message fell as overstuffed as the Thanksgiving turkey, but the organization and clean design make it easy to digest. This email is all about urgency and speed. It puts an attention-grabbing offer in the subject line. It adds a countdown timer and highlights the deadline. The copy addresses only the Thanksgiving Day offer. The "Shop Now" button is in a high-contrast color (gold, naturally). It also dresses up a standard 20%-off offer by focusing on the dollars saved rather than the percentage off. Even though this email does not boast the most modern design, it perfectly mimics the newspaper feel of other JCPenney emails. It's important for you to stay true to your brand. And remember, the holiday season is not the best time to introduce a brand new, untested, email design. Start planning your Thanksgiving email strategy with great examples. This The Vitamin Shoppe email calendar is based on The Vitamin Shoppe, who sent 1 emails for Thanksgiving in 2018. This Vans email calendar is based on Vans, who sent 2 emails for Thanksgiving in 2018. This Sanuk Footwear email calendar is based on Sanuk, who sent 0 emails for Thanksgiving in 2018. 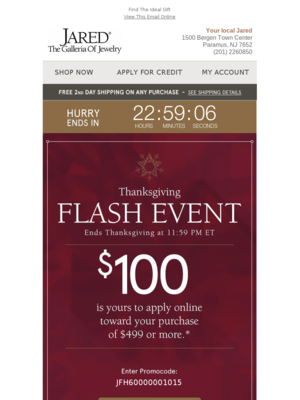 Will you simply send one email on Thanksgiving or will you send a few emails leading up to it, including a “last chance” email once the event is over? Based on 2903 emails mentioning "thanksgiving", "turkey", "gobble" in the subject line. Discover the most popular types of promotions used for Thanksgiving. Understand how steep a discount companies offer for Thanksgiving. You can toggle between Dollars Off and Percent Off. Ace your Thanksgiving email content with these ready-to-implement strategies. Enjoy! Until the last decade of the 20th Century, Thanksgiving was a day to spend with family and friends. Stores, offices and schools closed. The big commercial excitement came from the daily newspaper, stuffed to bursting with ads and inserts promoting after-Thanksgiving/Black Friday/early Christmas shopping. Enter the Internet, where stores never close unless the site crashes. Shoppers at loose ends during the day browsed and bought, and merchants were quick to capitalize on it with dedicated Thanksgiving Day promotions sent before or on Thanksgiving. 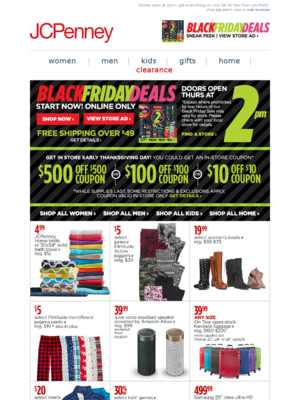 Online browsing and buying hasn’t generated the same negative public reaction that Thanksgiving Day shopper in physical stores generated, but many marketers still prefer to mark the day with a “thank you” email, often sent under the CEO’s imprimatur, to preview Black Friday/Cyber Monday deals or launch holiday gift guides and look books. Let’s dive into some email strategies you can use to ace your Thanksgiving email planning. Thanksgiving Day’s historical association with family gatherings and the religious (albeit non-denominational) aspect of giving thanks distinguish it from Black Friday and Cyber Monday, where the focus is squarely on scoring deals. That’s the cultural aspect of the equation. Now, here comes the data part: analyse historical traffic and email data (from Thanksgiving Day) to understand what your audience wants. Did they actively click on your emails and make purchases? Did open rate meet your expectations but not click rate? That can signal high interest but low intent. Aggressive promotions can work for some brands but backfire for others, especially if they market to older or traditional audiences. It’s your duty to know your customers as if they were your best friends — and we encourage you to create a report summarizing the insights you draw from this analysis. As Thanksgiving loses its distinction from the shopping days that follow it, your brand managers might want to change tactics. If you don’t believe your data or other factors support that move, you will be able to defend your position. The opposite scenario also is possible. Suppose your brand typically sends only a personal thank-you, but you know your customers browse and buy in sizable numbers on Thanksgiving. That could suggest they might welcome a low-key promotion. Normally you’d never want to change strategies in midstream, but you get only one shot a year with Thanksgiving Day. Consider splitting your audience in half and sending a different email message to each group – one with the traditional thank-you message, and another with a promotion attached as a secondary message. Track your results and use them in your Thanksgiving plan for next year. Note: Look at the results from Thanksgiving Day, but also analyse the impact this might have had across the five-day weekend. Make sure you’re not poaching sales from the rest of the long weekend. Don’t overlook the chance to say “thank you,” even if your Thanksgiving emails are all about deals and discounts. It’s easy to get caught up in the stress and strain of the holiday season. If you can’t devote an entire email to saying “thank you,” dedicate a key part of your email real estate to a short but sincere message, ideally signed by your head honcho, thanking customers for their business and wishing them a happy day. As with Black Friday and Cyber Monday, Thanksgiving Day email volume can threaten to flood the inbox. Customers who are occupied early in the day might miss your email when they finally have a chance to sit down and scroll through their inboxes. If you send a promotional campaign in the morning, consider resending it in the afternoon to those who registered no activity the first time around. You might want to revise the subject line if it includes a deadline or was clearly designed to be read early in the morning. However, know that everybody else is tacking “Last Chance!” and “Final Hours!” onto their emails. You must find another way to stand out.